I would like to print a part in TPU95A on my UM2E+ but the part need to have support because of flat surface so i was wondering if the support can be in TPU95A? In theory it can, but removal may be more difficult because of its flexible nature compared to ABS or PLA. Do you have a photo of your model? From my personal experience, if the part has a simple geometrical form, and you don't mind that the surface printed over the support isn't perfectly flat, it is doable. Get yourself scissors or something alike to cut off the bits that stick, and make sure that there is some space between the support and the part, else you'll never be able to remove it. @SandervG the is the part I want to try flexible with. I might change the geometry a bit but it's only the thickness and removing the cylinder at the top because for the rest it will be the same. @Brulti when you say space between the support and the part do you mean in the x and y axes? This is called support interface, and this can be configured for X, Y and Z dimension. Ok i'll try doing that! Yes, support interface, thanks @SandervG. I believe the settings for TPU95A on CURA already take that into account and the default settings have a small gap of a couple of layers between the support roof and the object being printer. That way, the support and object do not stick together and you can easily just peel the support away. From the look of your piece, you should only need support for the cylinder at the top and the ring halfway up. All the holes shouldn't be needing support, even the rectangular ones, TPU95A should bridge nicely enough to keep the shape. 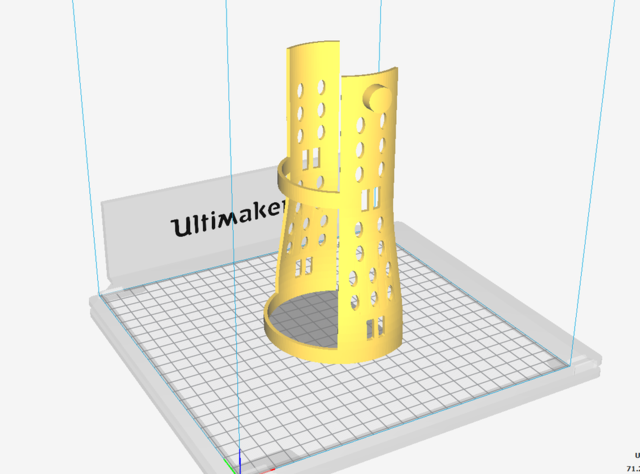 I'd suggest using the support blocker is CURA wants to put support in the small holes.